Memorial gifts include one line in the event program. Name, rank, and military service is required, war-time service will be noted at your request. The $5 price is the minimum donation to help with printing costs. Additional donations above the $5 price are truly appreciated and 100% of the donation will be used to support the cost of the banquet. No donation amounts will be listed or revealed to the one honored. The name of person (up to one line of text) making the Memorial will be listed in the program with your Hero. Should an individual be recognized more than once, the Veteran's information will be listed on one line, with all who recognized that Veteran to be listed below the person's name. A beautiful card will be sent to the family of the deceased veteran you honor letting them know of your appreciation and honor. 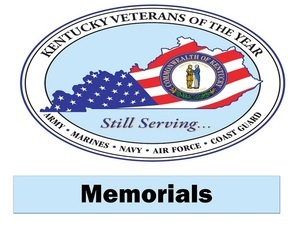 Memorialized Veterans need not be Kentucky Residents to be listed. Once you have clicked on the "Submit" button, you will be directed to copy and paste a link into your browser to submit your donation payment information. To insure proper donation credit, please tell us the first and last name on the Credit Card you will be using.